It’s too hot! So it’s time for a chilled summer soup. Gazpacho is the famous Spanish cold tomato soup, designed like a drinkable summer salad to cool you down when the weather just gets too much. We have Spanish neighbours who we swap tasty morsels with over the fence – when a bowl of salmorejo (the thicker big brother of gazpacho) was passed over it was like being transported straight to Seville. 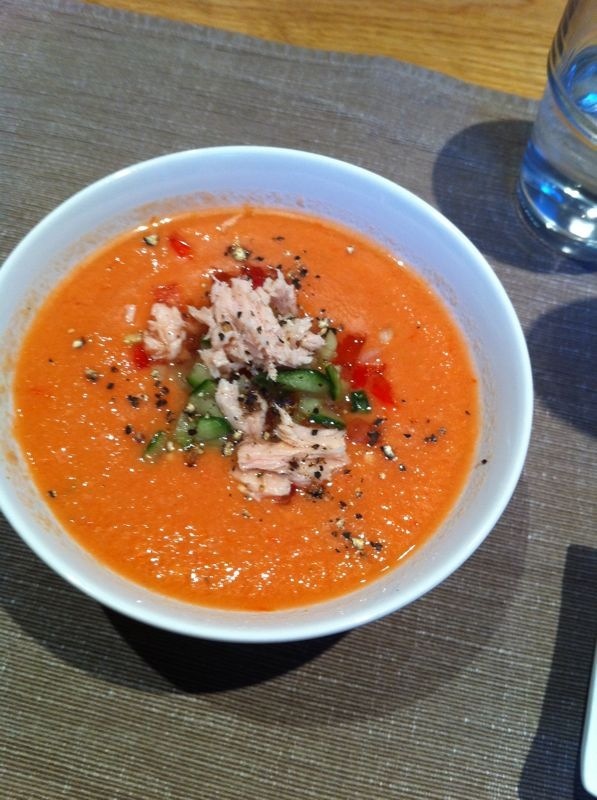 So this inspired us to try making a chilled gazpacho at our Supperclub. When the kitchen temperature reached 30 degrees, this was going to be the perfect chilled soup and it was easier than we expected. The veggie ingredients are available throughout the summer on the market and especially in the Turkish supermarkets in Walthamstow at bargain prices, plus it’s a fantastic way of getting your 5-a-day. 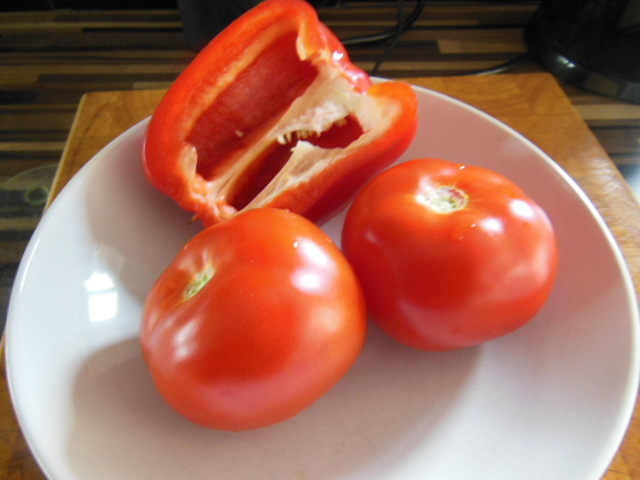 We found loads of fiddly recipes which suggested blanching and de-seeding the tomatoes, or sieving the soup at least three times – life’s too short for this in my opinion! Then there were versions with or without the peppers or adding bread as a thickener. We came up with this more simple version – it may be more E17 than Espana but we loved it. Wash and roughly chop the tomatoes and pepper, blend quickly. Next peel the cucumbers, chop into chunks, add to the blender and whiz again until pretty smooth. In a mortar and pestle crush the garlic cloves with a sprinkle of sea salt. Add this to the blender and whiz again. Slowly add the olive oil, then the vinegar. Sherry vinegar would be more authentic but it’s not easily available so we found that red wine vinegar and a splash of balsamic makes a good substitute (I’m sure we’re not the first to try this.) Taste and season with salt and pepper. Blend the whole mix until as smooth as possible. Now chill it for at least 2 hours. When you’re ready to serve, finely dice the tomato, pepper and cucumber. Ladle the soup into bowls, pop in an ice cube, sprinkle with the crunchy veggie toppings and a small amount of tuna if you eat fish or crispy croutons. Enjoy! 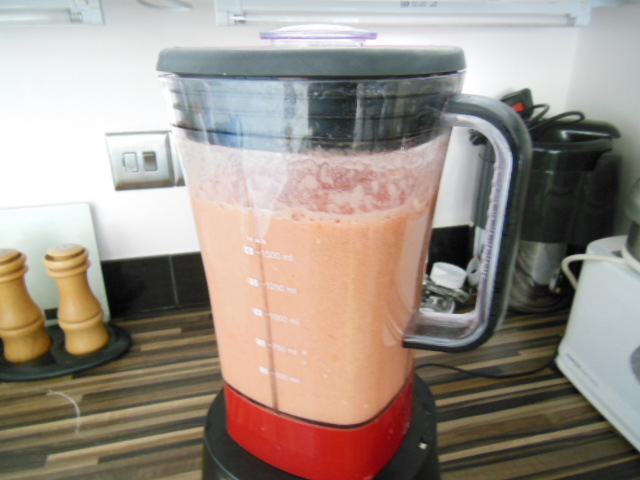 This entry was posted in Recipes and tagged chilled soup, cold soup, e17, Gazpacho, Olive oil, salmorejo, sherry vinegar, soup, spanish soup, Tomato, tomato soup, Walthamstow. Bookmark the permalink.